This topic was quite important to discuss as many of you asked about the way to show you pictures in Disqus comment system. As you would know that there is no option to show you avatar and this is because Disqus is 'Gravatar' enabled comment system. So all you guys need to do is to make an account at Gravatar. Its a globally recognized avatar system and it would be used at most of the places online in comment systems, forums etc. So i would recommend to make an account. Once you are done, your avatar would automaticly appear in the comment system below. Click the button at the site saying "Get your Gravatar today" as shown below. 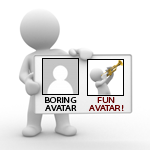 Avatars make the discussion board pretty alive. Give it a shot, its worth using.